Dr. Dwivedi teaches courses in Introduction to Linguistic Theory, Neurolinguistics and Syntax. Prior to teaching at Brock, she taught in the Department of Linguistics at McGill University, the University of Wisconsin-Madison, and the University of Massachusetts. ESL learners process their new language using a variety of cognitive resources. My research uses both linguistic theory and neuro-science to explore how second language learners process language in real time. Using this data, a model of language comprehension can be built that promises new insights into second language instruction. My goal is to provide second language instructors with improved methods for instruction and assessment that draw upon two separate routes of language processing: word meaning and syntactical/semantic rules. Ms. Kucharska has been a LINC instructor for the past 16 years and has experience teaching levels ranging from Literacy to CLB 8. This interactive workshop will explore how PBLA can be successfully implemented in your classroom. Participants will build their knowledge about backwards design lesson planning, task development, assessments and action oriented feedback. Focus will be on literacy and CLB 1-2." 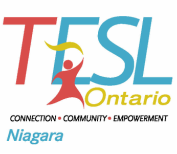 9 - 5 on TESL Niagara Spring 2015 Conference day.